Monkey Thank You and Other News! Hello! A friend of mine who volunteers for a monkey rescue organization asked if I could make her 25 monkey themed thank you cards! Well, this is what I came up with, and I just e-mailed her a picture so we'll see if she likes it :) I used this adorable monkey image from Whipper Snapper. I love the look of the cards with rounded corners, but have yet to try it. I really like how it came out! I will leave a full recipe below. My other news is that I am now a Divine Diva! The fabulous Lori Rider asked if I would like to be on the DT for her Divine Diva Inspiration Challenge. Of course I said yes, so the 1st and 3rd Thursday of the month I will post our inspiration picture and the card that I made. I hope you'll play along with us! My first challenge is this Thursday so come check it out! Thank you so much for stopping by today, and I'm off to color more monkeys lol! This is gorgeous Kerri and will go down a treat at the monkey sanctuary. Congratulations on becoming a Divine Diva! I think your friend will love it! It's a great card. The little scallops give it a great finishing touch. Congrats on being a Divine Diva. Can't wait to see your challenge card on Thursday! That monkey is SOOOOO CUTE!!! What a great set of thank you cards!!! HUGE Congrats on the new DT spot, YOU ROCK!! That is so cute Kerri! I love that monkey, but couldn't bring myself to spending $12 for it. he!he! Congrats on being a Divine Diva! Can't wait to play along. Look at that cute Monkey!! Too sweet!! Great design, coloring and colors Kerri!! 25 MONKEY cards...now there's a different request. I think the twine is a perfect touch for this card and it's more earthy and that'll appeal to the people these cards are for, I bet. Congrats on your new DT - - never heard of it....can't wait to see your work there. Now that is the cutest! What an adorable image (you colored it fabulously)! That is a really neat project to do, and I agree...those rounded edges look great! OOps! I also meant to say: CONGRATS on the DT!!!!! This is adorable! I'm sure you're friend will LOVE it!!! Congrats on becoming a Divine Diva!!! 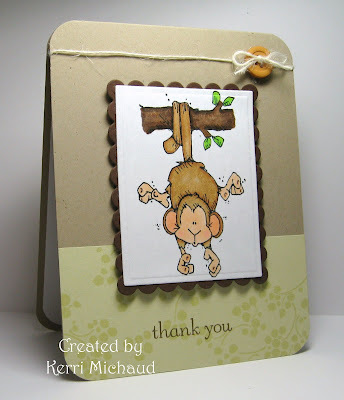 Very cute card, Kerri! I love this adorable monkey! Congratulations on becoming Divine Diva! Looking forward for Thursday! Your card is clean, simple and very pretty. Congrats on being a Divine Diva! This is adorable! Congrats on your new DT spot.